The DF140A, DF115A and DF100A include an O2 Sensor Feedback System that helps to keep emissions cleaner and more stable. In addition to this the DF140A and DF115A also benefit form a knock sensor that detects and controls abnormal combustion allowing the engine to operate at optimum performance. Recognizing a need for more fuel-efficient outboards, Suzuki developed and introduced its innovative Suzuki Lean Burn Control System on the DF90A/80A/70A outboards, which received great acclaim from boaters and the media alike. The system predicts fuel needs according to operating conditions allowing the engine to run on a more efficient fuel mixture through the use of a lean air to fuel ratio. Its benefits are delivered over a wide operating range providing significant improvements in fuel economy from low-speed operation up into the cruising range. 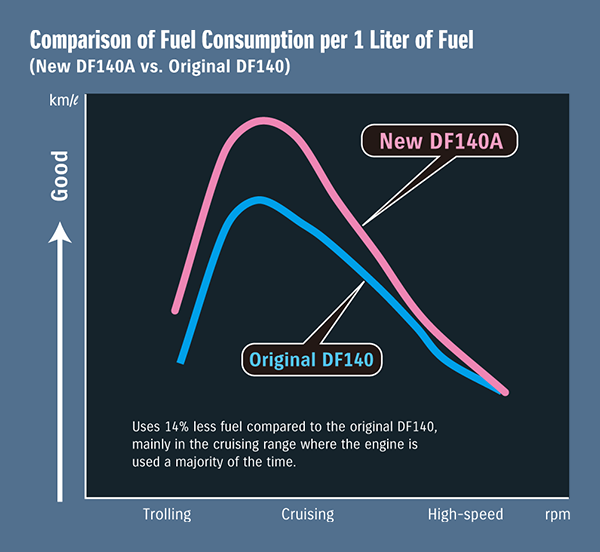 In-house testing shows that while cruising, the DF140A is 14% more economical than its predecessor without sacrificing any of the original DF140's power. Like Suzuki's flagship DF300AP, the DF140A/115A/100A feature an O2 Sensor Feedback Control system that keeps emissions cleaner and more stable. By controlling the air to fuel ratio across each of the engine's operating ranges, the system provides an optimum amount of fuel to the engine regardless of rpm. The DF140A/115A/100A utilize an enhanced air intake system that maximizes airflow into the engine to obtain greater power output. In order for this system to achieve full potential, greater exhaust efficiency is required as well, so the engines are designed with an efficient "4 into 2 into 1" exhaust system that reduces drag in the exhaust letting it flow smoothly out of the cylinders. This design increases low to mid-range torque on these outboards and provides the wide powerband that boaters want. 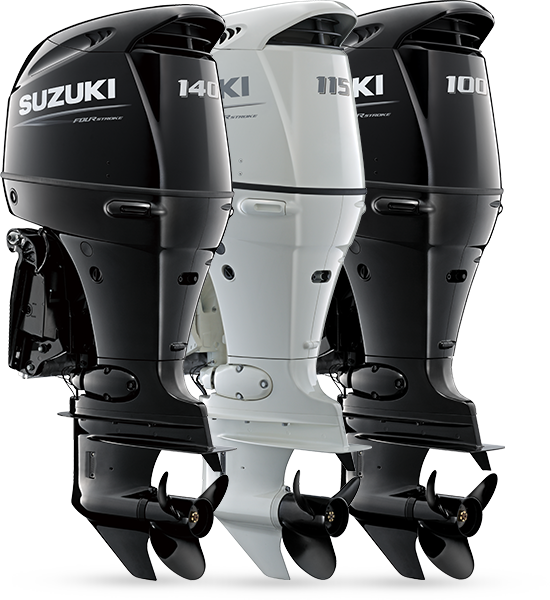 The DF140A and DF115A are Suzuki's first four-cylinder outboards featuring a knock sensor. Found on some V6 models, this system is used to detect and control abnormal combustion allowing the engine to operate at optimum performance. 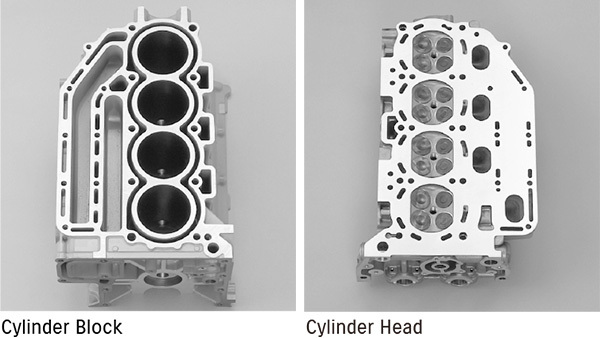 The system increases engine durability and helps deliver maximum power. Multi-Point Sequential Electronic Fuel Injection is Suzuki's sophisticated fuel injection system found on Suzuki outboards from the DF40A to DF 300A. The system uses a 32-bit computer in the electronic control unit to monitor vital operating data gathered from a series of sensors located in critical areas on the engine. Processing this data in real time, the system automatically calculates the optimum amount and exact timing of fuel to be injected at high pressure into the combustion chamber. Benefits include smoother and faster acceleration, crisp throttle response, maximum fuel economy, low emissions, and quick, reliable starts. The Suzuki Troll Mode System is optionally available on all three outboards. This system provides finer control over engine speed at low rpms keeping the boat moving at a steady speed while trolling. 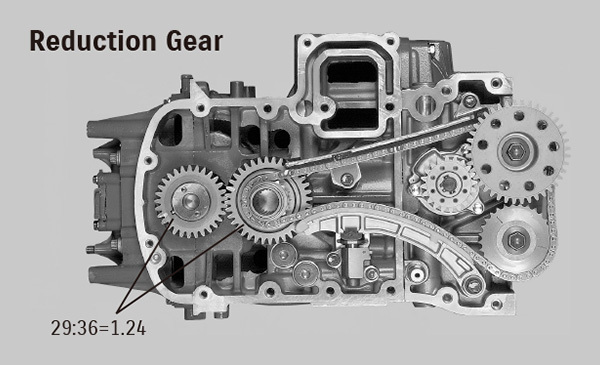 When the system is engaged, engine speed is controlled with an independent control switch that adjusts engine revs in 50rpm increments over a range that spans from idle to 1,200rpm. In addition to the control switch, which can be mounted nearly anywhere on the console, the system includes a tachometer and is compatible with Suzuki's SMIS digital gauges or the dual scale analog gauges. Available on the DF115A and DF100A only, Suzuki's Multi-Function Tiller handle is ergonomically designed using computer modeling to simulate the operator's body, arm, and eye movements to optimize placement of the shift lever, switches, and indicator and provide easier, more comfortable control of the outboard. The shift lever is also ergonomically designed to provide a comfortable feel whether it's operated with the left or right hand. The power trim and tilt switch is located on the handle grip allowing simultaneous operation of the throttle and trim and the handle also incorporates a Suzuki Troll Mode System switch.